Sarasota Dentistry » Blog » How Much Do Dental Implants REALLY Cost? Dental implants typically cost between $500 for the lowest grade product to $3,000 for a higher grade product. Some products can be significantly higher, even as much as $6,000 or more per implant (not including: bone, implant crowns, implant dentures or implant abutments). Bear in mind, that these estimated costs are per Implant – depending on the extent of the work that needs to be done you can expect to pay much more. You may be asking, why are dental implants so expensive? Many factors play a role in this cost. The experience of the provider is one factor. The type of material used and the brand of product used also plays a significant role in the cost. Additionally, the fabrication of the dental implant restoration can take many hours of dental laboratory work. You also have to take into consideration the work to be done, which generally includes bone grafting, existing teeth extraction, and numerous visits. It’s also important to recognize that dental implants are custom work. No two people are the same. Your dentist will work closely with you to not just install the implant, but also to shape and create the ideal artificial tooth for you. The more skill and experience the dental provider has, the more likely it is that you’ll have natural looking, strong, and healthy teeth for years to come. Bone Grafting: is it Needed and How Much Does it Cost? Dental implants are a type of dental procedure in which an implant, or structure, is placed into the bone of the jaw to support a prosthesis. This could be a denture, bridge, or crown. They work as an orthodontic anchor. They are perhaps the most authentic looking solution for those who have lost teeth or who are at risk of losing their teeth. Artificial teeth can be positioned onto the implant to create the natural look you desire. Modern dental implants are not only custom made, but they are highly effective and long-lasting. Most forms of dental implants are made from titanium or titanium alloys, and Zirconia. 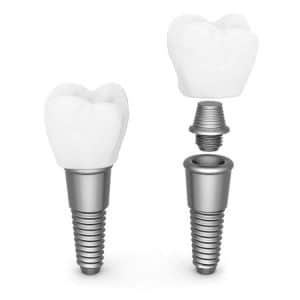 The implant has three components, the crown, or top portion that looks like a tooth, the connector (also referred to as an abutment), which helps connect the crown to the base, and the base itself, which is a titanium screw that then fuses with the bond in your jaw to create a strong, sturdy base. Many people wonder about the way these implants may feel once in place. The good news is they work much like your own teeth. They feel more comfortable than poor-fitting dentures. They do not hurt after the recovery period. They can also help ensure you can speak normally and clearly. They look and function just like your normal teeth.Many times, they create the natural, healthy smile you are looking for without many limitations. The major difference between your natural teeth and dental implants is the tooth has a shock absorber built into the bone called the “PDL” or periodontal ligament. The PDL protects natural teeth from trauma and also feeds back information to the brain regarding how hard you are biting. Fortunately, patients adapt quite well to any differences that may exist and greatly appreciate the permanent solution of dental implants over missing teeth or removable dentures and bridges. Most of the time, it will not be as painful to have dental implants installed as it is to have a tooth removed. Your dental provider will use medication to minimize any pain you may feel. 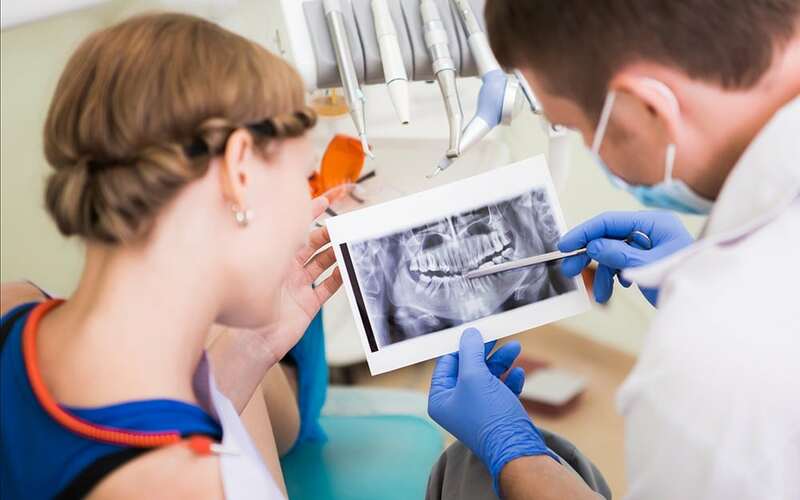 You may have mild discomfort following the procedure but you can be assured that a great dentist will insure you are comfortable throughout the procedure. Most patients prefer both local anesthesia and some form of dental sedation which ultimately guarantees a good experience. How Much Time Will It Take to Recover from Dental Implants? Generally speaking, the process takes some time for recovery. This time is very dependent on the number of implants installed and any additional procedures completed such as bone grafting and dental extractions. The entire process from tooth extraction, if needed, through the completion of the procedure is generally a timeframe of three to six months. However, you will be able to eat, chew, and speak during this timeframe. Immediate dental implants can speed up the process but may require little to no chewing for improved success. Most of the time, dental implants provide you with years of not just functional wear, but also natural looks. The length of time they last depends on the quality of the material, the type of product used, as well as the skill and experience of your dental care provider. It is likely that they will last 10 years. Many products last much longer than 15 years. Also, note that the length of their lifespan also depends on how well you maintain them. Routine dental appointments and proper oral hygiene can lengthen the lifespan of these products, giving you more use out of them without necessary repairs. When choosing a person to obtain dental support from, especially with a skill like dental implants, the experience of the professional matters. Look for a specialist who has years of experience with dental implants. They should be certified to provide any specific brand-name product, such as Clear Choice or All on Four Dental Implants. What Type of Dentist Does Dental Implants? Dental implants are not currently recognized as a specialty by the American Dental Association However, General dentists, oral surgeons, and periodontists are the most common dentists which place implants. In many cases, a general dentist will refer a patient to an oral surgeon or periodontist for the dental implant surgery. The patient will return to the dentist for the dental implant restoration following the healing period. It can be advantageous to work with a general dentist that is highly trained in bone grafting and dental implant surgery. These surgically trained general dentists both place and restore the dental implant which can be more comfortable for the patients versus seeing multiple dentists. Training, experience and reputation are the best indicators for choosing the right dental implant team. To prepare you for the dental implants, your dentist will need to gather as much information as possible about the health of your gums and oral cavity bones to your overall health. This is done initially through an x-ray and exam. Most dentists will use this as a starting point. From there, they will conduct a dental CT, also known as a CBCT (Cone Beam Computed Tomography). CBCT produce a small fraction of the radiation seen in medical CT’s. 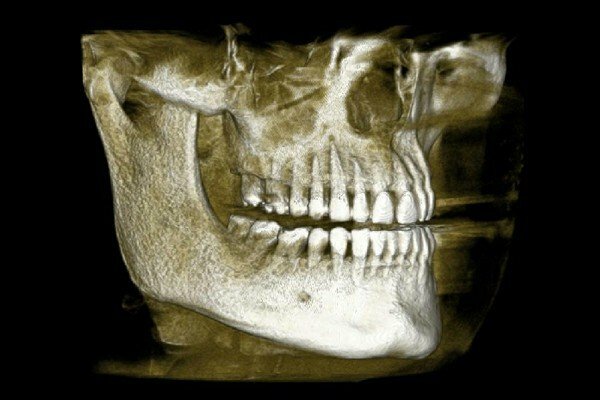 This scan allows the dentist to gather more insight into any areas of concern. Specifically, they need to ensure the bone is healthy, strong and wide enough to support the implants themselves. Additionally bone grafting may be indicated prior to implant therapy. You should also be overall healthy, which includes free from infections or other oral health concerns. It is routine for your dentist to consult with your physician to determine if you are healthy enough for dental implants or dental implant surgery. Generally speaking, there are three types of bone grafting. One type of bone grafting is the addition of bone to the socket after an existing tooth is extracted, also known as socket preservation. Generally, this can be done through a minor surgical procedure. Another type of bone grafting which is more involved and requires widening and/or lengthening the jaw bone is know as ridge augmentation. The third type is sinus augmentation which involves raising the sinus floor to grow bone in the upper molar region. Bone grafting can add time and money to the overall treatment plan costs but can be well worth it to have beautiful, strong teeth. Bone grafting is a common part of the dental implant process. In this procedure, doctors work to gather healthy bone from another area of your body, or use cadaver or animal donors, to implant into the jawbone. Over a period of time, this bone will grow and fuse with the existing jawbone, making it healthier and stronger. This process may allow you to get dental implants and keep them healthy for a lifetime. Bone grafting is typically necessary if you have significant bone loss in the jaw. Without this, it can be difficult for the implant to remain in place long term. Most people lose bone after a tooth has been removed. That is why it becomes necessary for most people getting implants to have some type of bone grafting. The cost of bone grafting ranges widely. Generally speaking, the cost is $300 to $800 per tooth or implant area. If the bone needs to be harvested from another area of your body, such as your hip or the chin, the costs for this procedure are likely to rise significantly. Additionally, synthetic bone growth factors may be indicated which are quite costly. They can then range from $2,000 to $3,000 per implant area. This is because it will involve two procedures and more invasive measures. Here is a closer look at some of the costs based on the type of implant selected. Verify costs with your dental provider. How Much Are Mini Dental Implants? You may learn that All on 4 Dental Implants are the type right for you. You can expect this form implant therapy to cost about $17,500 – $30,000, though prices can range significantly. How Much Does It Cost to Get Full Mouth of Dental Implants? If you need full mouth of dental implants, the cost will range based on the extensiveness of the work to be done. When you need multiple teeth implants, the cost will range from $25,000 – $80,000 and up depending on how many teeth are involved, as well as, bone grafting, dental extractions, temporary restorations. You may need just one dental implant. The costs here are significantly less especially if there is less work to be done. Expect these to cost between $1,000 and $3,000 each for the dental implant alone. Keep in mind that a dental implant requires and connector (abutment) and crown as well to be a fully functional tooth replacement. The complete cost of the three necessary parts ranges from about $3,000 and $6,000 and up. How Much Are Clear Choice Dental Implants? Clear Choice Dental Implants are a branded dental implant provider. This corporate dental practice tends to offer dental implant at a cost between $3000 and $6,000 for a single implant. What Is the Cost of Multiple Dental Implants? Most often, the cost is dependent on the number of teeth treated at one time. You can expect to pay $6,000 to $30,000 and up depending on the number for multiple dental implants installed. Same Day Dental Implants is a technique used to place dental implants at the same time the tooth is extracted, also knows as immediate dental implants. The costs for this product depends on various factors, but cost, on average $5,000 to $8,000 per implant with extraction and bone grafting. You should turn to your dental insurance policy to learn about specific coverage available to you. Your dental office can also provide some insight here. What Dental Insurance Covers Implants? Many types of dental insurance now cover implants. However, there are still quite a few that refuse to cover this procedure. Fortunately, many of those dental plans that do not cover a dental implant, still cover the crown that goes on the dental implant. Many of the basic dental plants do not cover implants. This depends on your policy. Some policies may cover the full cost. It is less common for this to occur, though. Some may pay a portion of the cost. Please ask your dentist or consult with your dental insurance provider. One of the options some dental providers offer is financing. You may be able to finance the purchase of dental implants through a service like Care Credit, your local bank or credit union, or a zero interest credit card offer. Your dental provider may offer in-house payment plans and other financing options as well.